Well, Another is about a spooky transparent being. Ali Projects’ OP is really victorianist-spooky. 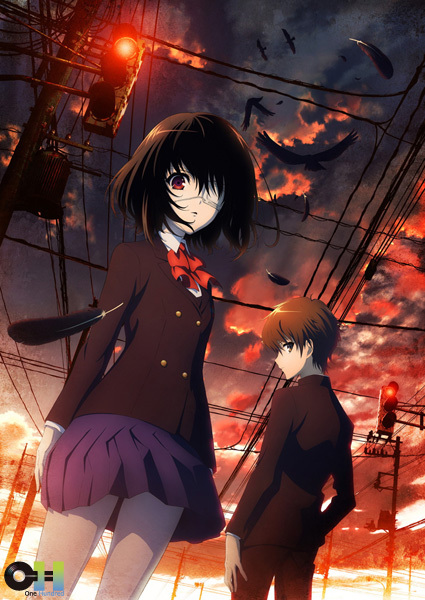 Yes, the main character Sakakibara Kouichi transfers to a new school in a remote village, later on he becomes transparent in this village. And the first thing you want to do is to assimilate in a new community. But, this village mentality is so sick, utterly backward, clinging to old obsolete medieval superstitions that scientists like Richard Dawkins have been proving all wrong, QED. Mura-hachibu (村八分 “exclusion”). Thus, he becomes “another.” You don’t belong to either class or school. You’re not one of us, but another. Out of system. Out of hierarchy. So, his existence becomes like a NEET. Not in education, employment, and training. Nowhere to be accepted. Yes, they treat your existence like transparent. They simply ignore you. They live like you don’t exist. “Self of transparent existence (透明な存在のボク).” This word was made famous by Sakakibara Seito (酒鬼薔薇 聖斗), the worst chuunibyou murderer, who was just a chuuni (14 years old) when he murdered children for his new founded “cult.” Sakakibara committed murder in 1997. And Another‘s protagonist’s name is also Sakakibara (榊原), but different kanji. And what grade is he in? The 9th grade (3rd grade of Japanese middle school). And Another‘s time frame is 1998. That means he was a 2nd grader in 1997, exactly the same grade as Sakakibara Seito! It can’t be this coincidental. So, I highly suspect that he is actually the reflection of Sakakibara Seito in 2-D! The same age, and sharing the same family name phonetically. I see many otakus commenting on Sakakibara with the same kanji (酒鬼薔薇), inducing laughter in an online community.”No. Not that Sakakibara! LOL!” But actually it might be! So, yes, 3-D Another was Sakakiraba Seito! And, 3-D Another from America was Cho Seung Hui, who experienced transparency in his school years. In his final moment, he exclaimed, “You made me do this!” Yes, as a new comer as a shy Asian boy, he couldn’t assimilate in American school, thus became “another,” and that led to the worst outcome of all. That incident was personally too shocking to me, as an immigrant of the East Asia. These two shocking incidents had a huge impact on me. “Another” is spooky or kimoi (feeling of abjection), hu? Since he’s transparent like a ghost. But to the ghosts, you effing backward thinking community is much spookier! That’s what I gonna say as a kimo-ota to riajuu society. Yes, school should be a fun place, since it originally meant “free time, leisure, pastime” in Greek. So, school should have been an Eden! On the contrary to school life, I wish I could be “another” in capitalist life. But if we do, we’ll starve to death, so we got to be visible all the time. Otherwise, no girl would date me. Who would date an unproductive man who is invisible in the market? “Hey, I’m available to work for you!” Like a lapdog wagging its tail, wan-wan (I’m more than happy to serve you)! Just like Shiba-inu-ko-san! The employers want to have output without us if they can, or employment without salary. But that’s slavery. So, they invented “volunteers” and “interns.” The words are so noble, but a facade, an elaborate charade, in other words, voluntary servitude. Voluntary slavery. And we have to pretend our service is “voluntary.” Sad Yes-men. Nobody can admit in public that it’s actually involuntarism. Frankly workingmen want income without work, “unearned income.” Like Neo-NEET. So, we don’t need labor. Money without labor! So, yes, rather than dealing with that stupid village, I wish Sakakibara to just get out of it. They treat me like an outcast? Fine. Then, I’ll leave! But probably he doesn’t have enough dinero to get out just like me. If I do, I will never work but spend my time traveling to the countries I want to go, like Sweden and Brazil. Aristotle said only god or animal can be “another.” So NEET is “another,” thus a god. So, NEET can be new God of the new world! Remaking our Eden! Why should we pay for Adam and Eve’s sin? Why should I suffer stress allergy from labor? Nonsense. Just like I didn’t torture Koreans and Chinese. I didn’t fight for slavery. Just our stupid ancestors did. So, I’m not responsible for their crimes. Why should we make up for their mistakes? Our debts should be written off, or it shouldn’t be incurring in the first place. When will we be regaining the Eden? Nice read as always, i agree 100% with your post, and the sad thing is that this way of living is heading the society to a point of break in the near future, when the resources, natural or non natural will not be enough to support all of us, and the funny thing is that this situation will be reach because the way they did design our society, therefore the old concept that the human will destroy itself, holds some water in the end, all the malevious ideas in order to control society and the way we live in this world, will come back to hunt them in the end, the bad part is that is going to get all of us as well, but thats our price to pay for been sheeps following the shepard. Thank you for reading my article. Yes, that’s completely 3D. 3D world is so limited. Humans’ history has been wars over limited resources, limited land, territory, just like the Zentradi. Or Hitler’s lebensraum. Small village mentality is because of limited resources. They develop superstitions (racism) as device to protect themselves from the outside threat. So they don’t welcome new comers, like today’s Arizona’s law. Anybody could come to America, but now America has become a small village, no more frontiers, no more pies to share. Everyday is swayamvara. Draupadi from Mahabharata should’ve married 8 men instead of 5. So the rest of 3 wouldn’t have had to be kimo-ota. Simply there are too many dudes over girls. Who needs money if resources are infinite? What we need is abundance. Like 2D, so we never go thirsty or hungry again since 2D girls are infinite. Yes, yuri! All girl’s world. My yuri craze means “No!” to this stifling dude’s world. Or at least, there must be a way to get access to resources without subjugating ourselves to labor or corporate exploitation.